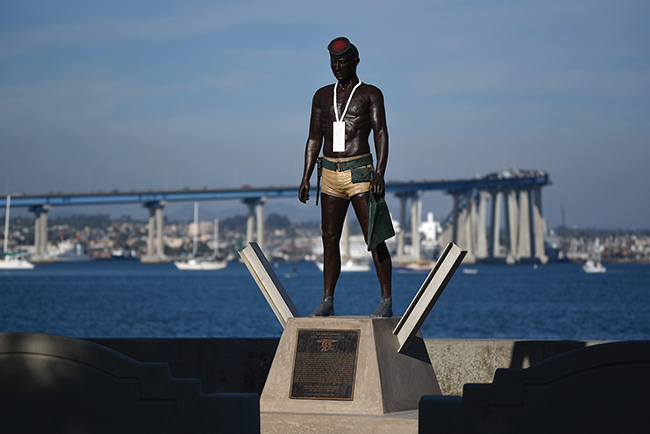 “Naked Warrior,” a bronze statue by sculptor John Seward Johnson II, commemorates the Navy’s Underwater Demolition Teams (UDTs) of World War II, and will debut this Veterans Day on a site overlooking Glorietta Bay and the Naval Amphibious Base Coronado to the south. A dedication ceremony is set for 11 a.m. on Friday, Nov. 11 at Glorietta Bay Park, with a reception following at the Coronado Boathouse and Clubroom. These World War II combat swimmers were the pioneers of today’s elite SEAL teams, and the Naked Warrior statue honors all UDT and SEAL team members, many of whom trained in Coronado. Outfitted only with swim fins, a face mask, a K-Bar knife and a slate board and led pencil on which to record intelligence gathered, these frogmen often embarked on dangerous underwater assignments. They would swim into enemy waters from far offshore to reconnoiter heavily defended beaches, then return with explosives to destroy any obstacles that might impede Allied amphibious landings. The city of Coronado’s Cultural Arts Commission, a seven-member commission chaired by Jeff Tyler, was notified last December that an offer had been made by the National Navy UDT-SEAL Museum in Fort Pierce, Fla. to gift the city the statue. The Commission began investigating the monument and a possible site, soliciting input from the city’s Parks and Recreation, Historic Resource and Design Review commissions. Johnson is the grandson of Robert Wood Johnson, the co-founder of Johnson & Johnson. Notable works include “Forever Marilyn,” depicting the iconic Marilyn Monroe pose where the star is standing above the gusty subway grate from the movie The Seven Year Itch; “Allow Me,” depicting a man carrying an umbrella and hailing a cab that now stands in Portland, Ore. The Coronado sculpture is the third casting of “Naked Warrior” on public display. The first was installed in 1986 at the National Navy UDT-SEAL Museum. A second casting was installed in 2014 at Honolulu’s Waimanalo Beach, where the first UDTs were trained and deployed from the Amphibious Training Base at Waimanalo (Bellows Air Force Station). The statue is approximately six feet tall and mounted on a two-foot “horned scully” with steel X-beams (evocative of the obstacles on Omaha Beach), typical of the underwater obstacles the UDTs risked their lives to destroy. Although the statue was a gift from the Navy SEAL Museum, the city of Coronado built the statue’s base, installed lighting and enhanced the landscaping around the site at a cost of $50,000.